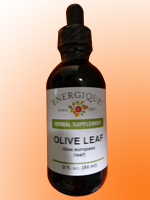 Our OLIVE LEAF provides a potent source of oleuropein which is the main beneficial element in the olives tree, supporting healthy cholesterol, blood pressure, and the immune system. For ease of use, Energique Liquefied Herbals have been formulated using different concentration levels to yield a common suggested usage level of 10-30 drops. Take 10 to 30 drops in water or juice 3 times daily or as otherwise directed. Shake well before use.